Health officials are now monitoring 50 people in Texas for signs of Ebola via twice-daily temperature checks, and in recent days, there have been reports of people in other areas of the country -- including Washington, D.C. -- suspected of having the virus, although most have been ruled out. But why can't all these people just be tested for Ebola as soon as possible? Ebola is difficult to diagnose when a person is first infected because the early symptoms, such as fever, are also symptoms of other diseases, such as malaria and typhoid fever. The main question doctors consider is whether the person has been in one of the countries in West Africa experiencing the current Ebola outbreak (Guinea, Sierra Leone or Liberia) within the last 21 days, which is the incubation period of the virus, Hirsch told Live Science. Or, whether that person has been exposed to someone has been one of those places, he added. Earlier this week, a man in Texas became the first person to be diagnosed with Ebola in the United States, after traveling to Dallas from Liberia. The patient sought medical care but was initially sent home, before being admitted to a hospital in Dallas and testing positive for the virus. Ebola spreads via contact with the blood or bodily fluids of an infected person, objects contaminated with those fluids or contact with infected animals; it does not spread through the air. Symptoms of the disease include a fever greater than101.5 degrees Fahrenheit (38.6 degrees Celsius), severe headache, muscle pain, diarrhea, vomiting, abdominal pain or unexplained hemorrhage, according to the Centers for Disease Control and Prevention (CDC). If a person shows these symptoms and has been in an area with Ebola within the past 21 days, they should be put in isolation and tested for Ebola, the CDC says. A number of tests can be used to diagnose Ebola within a few days of the onset of symptoms, which can detect the virus's genetic material or the presence of antibodies against the pathogen. The most accurate of these is likely the polymerase chain reaction (PCR) test, a technique that looks for genetic material from the virus and creates enough copies of it that it can be detected, Hirsch said. "PCR is a really definitive test," Hirsch said. It can pick up very small amounts of the virus. However, this test can be negative during the first three days an infected person has symptoms, said Dr. Sandro Cinti, an infectious-disease specialist at the University of Michigan Hospital System/Ann Arbor VA Health System. "Somebody could be in the hospital for three to five days before a diagnosis [of Ebola] is confirmed," Cinti told Live Science. "The important thing is keeping the patient isolated until you can get to a diagnosis." Meanwhile, doctors will be running tests to rule out other diseases, such as malaria, which can be detected more quickly than Ebola, he said. Another test for Ebola looks for antibodies produced by the body's immune system in response to the virus. Known as the antigen-capture enzyme-linked immunosorbent assay (ELISA), this test can take even longer than three days to give a positive result for an infected person, Cinti said. And antibodies can also be detected after a patient recovers, he added. Once a patient is diagnosed with Ebola, scientists may attempt to isolate the virus -- which is a type of filovirus, known for their filamentlike shape -- by culturing it with living cells and examine it using electron microscopy. 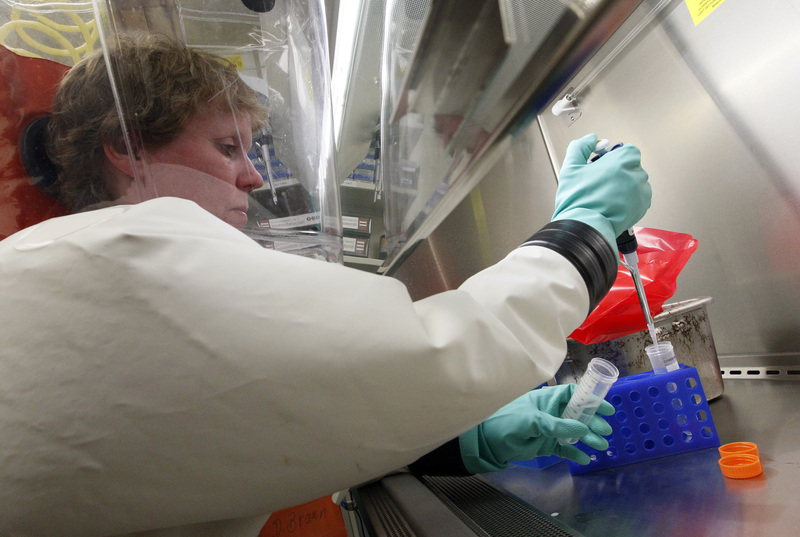 But culturing Ebola is very dangerous, and should only be done in a high-biosafety-level lab, Hirsch said. Culturing the virus is not a practical means of diagnosing infection, but may help researchers understand how the virus infects cells and test possible treatments. So, given the severity of an Ebola infection, why wouldn't you test everybody with the remotest chance of having the disease? A huge number of people come to the United States from Africa with fevers, Cinti said, and testing all of them for Ebola would drain hospital resources and raise unnecessary panic. "We really have to be clear and get good histories about exposure," he said. "It makes absolutely zero sense to test people who aren't from high-risk areas."